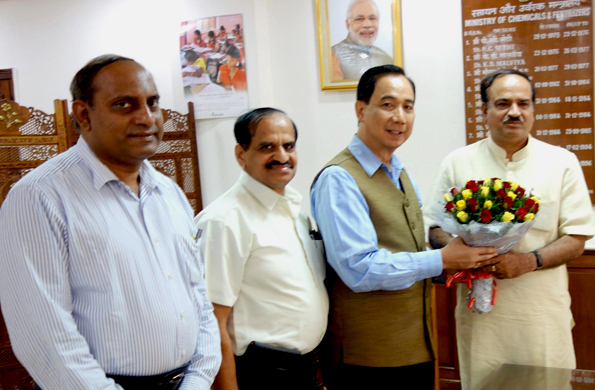 Efforts to bring about a shift in fertilizer use across India and means to achieve sustainable development in smallholder agriculture were discussed at the meeting between ICRISAT Director General Dr William D Dar and India’s Union Minister for Chemicals and Fertilizers Ananth Kumar. Three concepts – soil health mapping for developing balanced fertilizer recommendation; boosting pulses production through cultivation of rice fallows and rainy season fallows; and rainwater harvesting by adopting a holistic approach – were presented to the Minister. The Minister assured that a task force would be constituted at the earliest to operationalize these ideas and also with the aim of drafting a balanced fertilization policy framework in the country. The case study of Bhoochetana (land rejuvenation) program, implemented in the states of Karnataka and Andhra Pradesh in India, was also presented. In the Bhoochetana project using soil analysis as an entry point, soil nutrient recommendations were developed, demonstrated, and scaled-out to cover 5.5 million ha in 30 districts of Karnataka. Nearly 4.75 million farming families are harnessing the benefits of the program through increased agricultural productivity. The estimated net economic gains from Bhoochetana are estimated to be about US$ 240 million in four years. The meeting was held in New Delhi on the 18 June and attended by ICRISAT’s Dr Suhas P Wani, Dr G Narendra Kumar; Dr KV Raju, Economic Advisor to the Chief Minister of Karnataka; Mr Indrajit Singh Pal, Secretary, Chemicals and Fertilizers; Mr Satish Chandra, Mr SK Lohia and Mr Sham Lal Goyal, Joint Secretaries, Chemicals and Fertilizers; and other officials of the Ministry. Three hundred pigeonpea farmers across 37 villages in India are to trial using phablets and mobile phones for the latest farming and marketing advice. This is part of a pilot on a new business model for sharing information that is a win-win for all the players along the value chain. The pilot “Use and Sustain ICT Innovations for Pigeonpea Value Chain” was launched on 18 June by Member of Parliament Mr AP Jithender Reddy in the presence of 400 farmers including 300 women farmers. Mr APJ Reddy said, “I am happy to note that a renowned international institution like ICRISAT is working for uplifting the poor farmers in Addakal mandal of Mahabubnagar district of Telangana state.” He expressed hope that the efforts will lead to productivity enhancement of other rainfed crops like pigeonpea, chickpea, groundnut and sorghum. ICRISAT will partner with identified farmers of the district and share with them its knowledge in pigeonpea cultivation in addition to providing complete technology support for the pilot. Mr A Venkateswara Reddy, MLA Devarakadra, praised the efforts of Adarsha Mahila Samaikhya and requested all officials of the state agriculture department to develop similar models in their respective mandals. Dr Guntuku demonstrated the use of Green Phablets and mobiles for disseminating agricultural information and showed how pico projectors can be a useful tool for educating farmers. Based on the results of the pilot, the project will be extended to the other mandate crops of ICRISAT viz. chickpea, groundnut, sorghum and pearl millet. This activity is being undertaken as part of Tropical Legumes II project which is funded by the Bill & Melinda Gates Foundation. 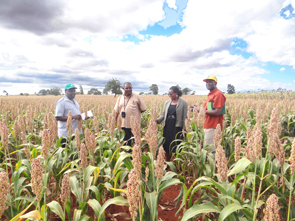 The interventions of a private-public partnership backed by science over the last five years, have helped sorghum farmers overcome the challenge of extreme climate variability. Drs WD Dar and Stefania Grando interacting with Ms Pate Shalini Devdas, a woman farmer from Maharashtra, India. Scientists have helped farmers in Maharashtra in India with postrainy sorghum with, in-situ soil moisture conservation, improved cultivars, seed treatment, crop management practices; and input and output market linkages. Building on the strength of this partnership, a ‘seed consortium’ was formed in 2013 by roping in the Maharashtra state seed corporation (Mahabeej) which offered buy-back guarantee for seed farmers. The seed produced during the 2013 season was sufficient to cover the requirement of 30,000 farmers in the 2014 postrainy season. 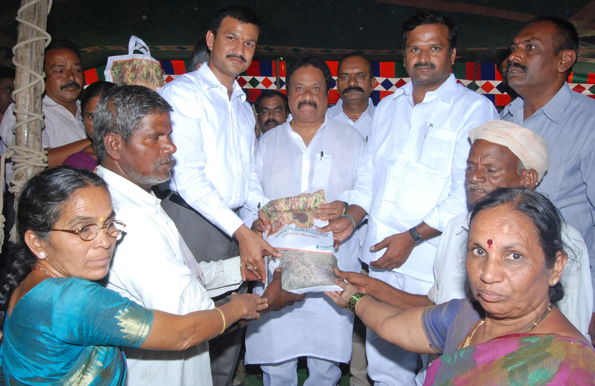 Thus the project benefited 300,000 farmers in five years. Nearly 30% higher fodder yields and 39% higher grain yields were reported in the regions. Improved varieties fetched higher market prices (US$ 83 per ton of grain) over local varieties. This remarkable impact was shared at the Fifth Annual Review and work plan development meeting of the Harnessing Opportunities for Productivity Enhancement (HOPE) of Sorghum and Millets project conducted at ICRISAT headquarters in India on 12 June. The project has helped more than 42,000 sorghum farmers by reducing the yield gaps by 25-30%, and enhancing the farmers’ incomes by 33-44%. This has been made possible with strong project partners: Mahatma Phule Krishi Vidyapeeth (MPKV), Vasantrao Naik Marathwada Krishi Vidyapeeth (VNMKV), Directorate of Sorghum Research (DSR), and other stakeholders. Grown on more than 3 million ha, postrainy sorghum is a lifeline of the dryland farmers across the eastern and western regions of Maharashtra. Sorghum caters to the calorie and nutritional requirements of the people and is sought after as animal feed. The Bill & Melinda Gates Foundation funds the HOPE project on three crops (sorghum, pearl millet and finger millet) in 11 countries including India. 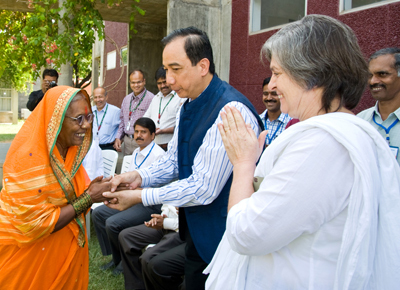 ICRISAT is the lead center for sorghum. At the meeting, ICRISAT Director General Dr William D Dar commended the dedicated efforts of the project team and partner institutions, particularly in transferring the technologies to 300,000 farmers and making a difference in their lives. He called for sustaining and enhancing the interventions to make the crop more profitable to farmers. Two farmers from the Marathwada region (eastern Maharashtra) gave an account of how HOPE project interventions helped them achieve higher yields and better returns. The HOPE project is undertaken as part of the CGIAR Research Program on Dryland Cereals. 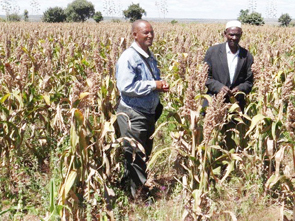 In finger millet, farmers preferred varieties P224 and UFM 149 for their big heads and varieties Acc 14, KNE 628 and KNE 688 for good head shape, no lodging and good grain color. All the sorghum PVS and PHS were combined with water management option of tied ridges. The team visiting a sorghum farm. Striga management using striga resistant varieties (Wahi and Hakika) and farmyard manure were demonstrated at various sites. 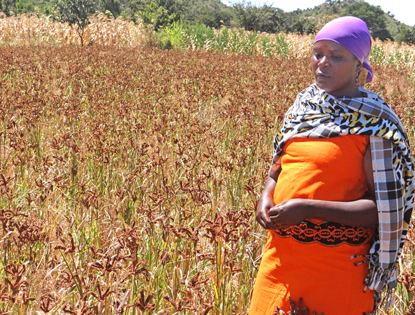 At Ngamu village in Singida, Mr Shaban Dule, a farmer, was elated when he observed less than 10% striga infestation on resistant variety Hakika in a field which had more than 80% infestation on a local variety last season. “There is a need to transfer research from lab to land to benefit smallholder farmers. To attain this, ICRISAT is continually ready to partner with agricultural and other research institutions,” said ICRISAT Director General, Dr William D Dar. Dr Dar was speaking as the chief guest at the launch of a program for initiating ICT- mediated extension activities, held at Acharya NG Ranga Agricultural University (ANGRAU), Hyderabad, India, on 13 June. Dr Dar added that in order to speed up technology adoption, there is a need to overhaul the agricultural extension system and develop a framework that utilizes Information and Communication Technology (ICT) to improve information management and delivery for farmers as well as extension officers. The project will be implemented through three Krishi Vigyan Kendras and two District Agricultural Advisory and Transfer of Technology Centres. Both educational as well as advisory services will be provided to 300 farmers from each center. The program would make use of the successful ICT models Krishi Gyan Sagar and Krishi Vani – powered by the Green SIM. On the occasion the J Raghotham Reddy-William D Dar Student Scholarships for the year 2014 were announced for seven major scientific disciplines. The scholarships allow students to complete their course work at ANGRAU and then pursue their graduate research work on real time research projects at ICRISAT. The scholarship program was launched in December 2013. 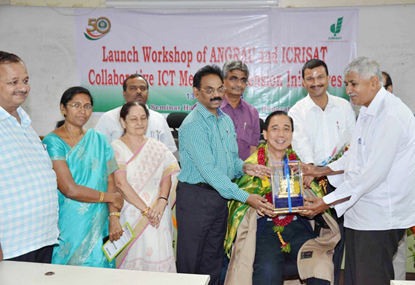 ICRISAT and ANGRAU have had a long relationship in working towards reforms in the extension system through the innovative use of ICT tools. “ANGRAU is strongly committed to its collaboration with ICRISAT,” said Dr A Padma Raju, Vice Chancellor, ANGRAU. Dr AP Raju also honored Dr WD Dar for his excellence in agricultural leadership, outstanding achievement, and exemplary vision in the field of agriculture globally. Dr Dileepkumar Guntuku, an alumnus of the University was also felicitated. 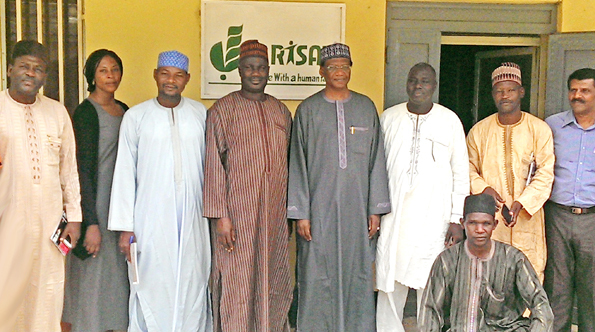 To further strengthen partnerships with ICRISAT, the Executive Secretary of the Agricultural Research Council of Nigeria (ARCN), Prof Baba Yusuf Abubakar, along with his team visited ICRISAT-Nigeria office based in Kano on 10 June. Prof BY Abubakar urged ICRISAT staff to work closely with ARCN to solicit financial support from the Federal Government of Nigeria. He assured that during the 2015 budget allocation exercise ICRISAT’s needs would be considered. Ongoing collaboration with Institute for Agricultural Research (IAR), Ahmadu Bello University, Samaru-Zaria and with Lake Chad Research Institute (LCRI), Maiduguri and Centre for Dryland Agriculture, Bayero University, and Kano. To celebrate the contribution of genomics in plant research, the French Plant Genomic Resources Center (CNRGV) organized “Plant Genomes’ Day” to coincide with its 10th anniversary celebrations on 4 June. Twelve leading scientists who played a major role in the development of plant genomics were invited to present and share their views on the future of genomics. Dr Rajeev Varshney, Research Program Director-Grain Legumes, ICRISAT made a presentation on “Genomics strides in grain legumes” at the event. 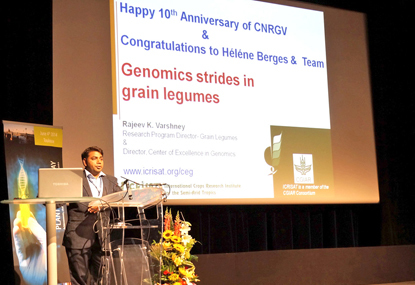 CNRGV was established by the Institut National de la Recherche Agronomique (INRA) in 2004 for preserving and maintaining plant genomic resources produced in the context of major projects by internationally-renowned laboratories. CNRGV is a repository center for all the plant genomic libraries and also a service provider dedicated to the scientific community.